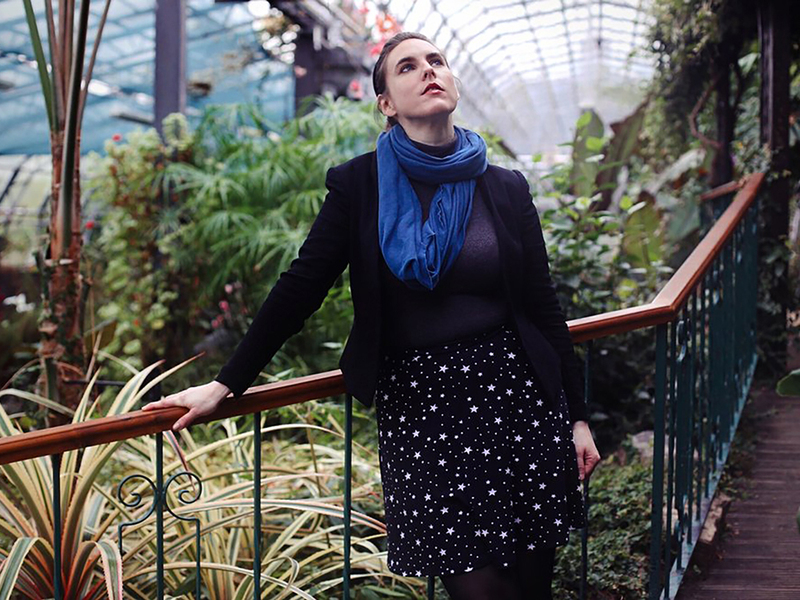 Helen McClory is a prolific writer of flash fiction and short stories, as well as a novelist and an advocate for overlooked works of literature. In reviewing her two story collections for Splice, Daniel Davis Wood called McClory a “distinctive” writer who “survey[s] the stuff of folklore and mythology and weav[es] it into serious fiction with vivid imagery and poetic flair”. 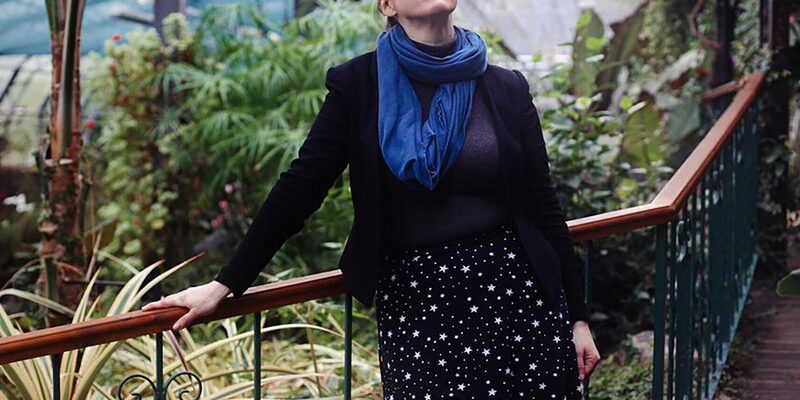 Throughout the summer of 2018, following the publication of her most recent collection, Mayhem & Death, Helen McClory generously set aside time to talk to Daniel about her work, her interest in different literary forms, and her plans for the future. You have a really interesting, roundabout relationship with flash fiction. You’ve said in interviews that you wrote your first collection of stories, On the Edges of Vision (2015), after you’d written your novel Flesh of the Peach (2017), as kind of an exercise in creative fun. 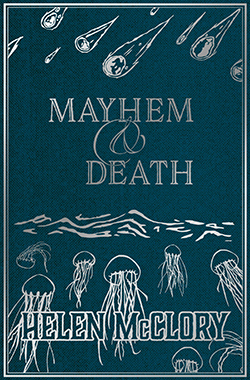 Now your new collection, Mayhem & Death, ends with a novella that is considerably longer than all the other pieces in the book. So it seems like your approach to flash fiction doesn’t just come from a devotion to one form of literature; it’s also shaped by your involvement with other, longer forms which you’re equally skilled at. Why keep going back to it, then — unjustly under-appreciated as it is — when you know you can do amazing things with forms that attract more respectability, and more readers? What does it give you, creatively, that longer forms don’t? I’ve never thought about this before: why return to flash? I think that’s because ever since I discovered it as a form, flash has felt right, the right use of my tendency towards hybridisation. There’s something between the dog and the wolf about it: the poetic prose, but not prose poetry, able to shift into direct, more traditionally realistic modes, but then swiftly about-face and become wild again in a moment. Longer forms don’t have that specific quality. A novel drifts through its moods over years, a big galley ship. A novella is an exercise in staging a set and following the story through to its end. Flash fiction shivers, mutates, blooms in its tiny space. I don’t know what I’m going to write when I set out to do it. I hope that the fluidity and experimental feeling of it is transmitted to the reader, too..
It’s amazing to hear you put it like that, because that is exactly what it’s like to read your work, and not just your shorter work. Flesh of the Peach does have a meditative, drifting quality; the novella ‘Powdered Milk’, which concludes Mayhem & Death, feels like a narrative set on a stage with the walls closing in; and your flash stories have the vibe of one-off experiments, a fresh start each time. Just thinking back to On the Edges of Vision for now, can you elaborate a little bit on how you conducted your experiments? It’s easy to read something like ‘Ipseity’ as a piece of flash in the full sense of that word, conceived and executed swiftly, because of the way it undercuts its own scope. But it’s a bit harder to read ‘Pretty Dead Girl Takes a Break’ in the same way, or ‘Sexually Frustrated Mermaids’. The ideas behind these stories seem like they’ve been mulled over for a while, even if the stories themselves are brisk and pointed. So is it the case that you sometimes sat down with just a single image in mind and tried to build an impromptu story from it, to see where the writing would take you? Or did you more often use the formal constraints of flash to give a sense of immediacy and urgency to ideas you’d been sitting on for some time? Hmmm, a little of both, as every writer brings their life experiences, outlooks, peeves, and admirations to what they write. ‘Pretty Dead Girl Takes a Break’ is a good example. With that story, I really did just sit down and write in a flurry, so the actual writing of the story took maybe twenty minutes, but what led up to that point were decades of exposure to the misogyny of crime procedurals (and in particular, watching the first season of True Detective). I wouldn’t say I had a didactic mindset when I wrote it, but the personal is political and writing is political, and feeling the personal aspects of the political situation ignited the writing. Other times, though, it’s not political so much as scientific. I’ll read a really mindbreaking piece on quantum physics, and I’ll be struggling towards understanding, and the ideas will spill out into the writing…. So how then do you use the flash form to contain the ideas? Your books are abundant with ideas (including ideas on concepts related to quantum physics!) but each of the individual stories seems to be fuelled by just one big burning concept. Do you have rules that you impose, to keep your stories contained and compressed? Not rules, but principles. I have tended to write flash fiction with the idea in mind of building a collection, of writing stories that will end up alongside other stories, and I think the structure that keeps each individual piece together is, in a way, the structure I pick for the collection it will belong to. 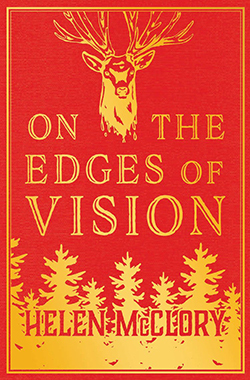 On the Edges of Vision had a unifying theme of writing the monstrous humanity — what is monstrous about being human, what is human in the monsters of our myths. Mayhem & Death was built with the interconnective tissue of a story of a fraught relationship between a mother and daughter. These big structural choices, I think, ended up giving each individual cog, no matter how variable, an underlying tension, and a connection to the whole..
What sort of labour does this involve for you once you’ve taken a stab at a first draft? Revisions and scaling back where you feel that things are excessive? Building out details where you feel like you don’t have enough? Editing after the first draft is the harder part of the process. Sometimes edits are very light, just shifting a line. Every word must justify itself, and that means that each word has to feel right, not just in terms of content but also poetic feeling. I tend not to have to cut down a lot; I write short, then add more in, although sometimes I end up adding extraneous material which has to be cut later again. Overall, I think the bone or the beam is more beautiful than the fleshed body. Not always, but that’s the guiding principle. So, whatever the tone of the piece, I try to keep it fine. And keep it on-theme..
It’s interesting that you’re clear about the thematic distinction between On the Edges of Vision and Mayhem & Death. It’s noticeable, but what’s more striking is the difference in ambition. Even though most of the new stories are about the same length as the earlier ones, they’re more adept at evoking very abstract, complicated things (like the dynamics of a fraught relationship) in economical ways. So in Mayhem & Death you seem to be more ready, or willing, to take on thorny subjects in a form where the compression doesn’t make easy to go into details. It’s risky, but you pull it off. Where did this readiness come from? Were you reading other writers who were doing things you wanted to respond to? What made you think it was time to test yourself by taking your stories in this direction? Thank you for finding Mayhem & Death more ambitious. I honestly didn’t begin with a mission of complexity in mind, but I think it was a natural progression, coming from my admiration from writers who really push themselves to stare life in the face, people like Jean Rhys, Muriel Spark, Toni Morrison, and so on. I would feel pretty awful if my work became less ambitious, though thinking ahead, I would love to learn how to be formally simple and still have texts capable of bearing weight. When thinking of what I am doing with my work, I think of all the people writing today, all the books written, a great mass of human communication constantly being produced, and I wish to make my contribution, small as it is, a little thread of being in the great tapestry, and I don’t want it to be a flimsy thread. Even though I know that my talents are limited — but as long as I am trying my best, and my best is a mark moving forward, I need not be ashamed..
What about your more stylistically experimental pieces? In Mayhem & Death, I’m thinking of things like ‘A Charm for the World As It Is’ and ‘Take Care, I Love You’, and even ‘The Inciting Incident’: all of which seem to waver between flash fiction and prose poetry in really beautiful ways. What is it that leads you to deviate from the style of most of your other stories here, while still feeling that these stories belong to the bigger picture? All the above being said, I think a sense of play and experimentation is important, even if an experiment goes wrong – is unreadable, conveys nothing sustained – it furthers what I can do in the long run. It allows me to grow, it gives the reader something that requires them to engage in a way that challenges, and perhaps delights them. This is what I want when I am reading. Years from now, I hope to be able to have a whole range of techniques I can use, and still more ahead of me to find. In terms of how they fit into the bigger picture, I can see that they tie in thematically to Mayhem & Death’s preoccupations with loneliness, the need to communicate, the desire for community amid the sense of the crumbling anthropocene of despots and environmental degradation. An experimental work is in a sense a statement of hopefulness, hope for the future, for change. Even if that change is not for the better, it is still continuity. Writing, generally, contains within it the idea that things will continue (as one page follows another) while experimental work allows for us to ask, but what if it were radically different, still words, but vital in a new way.. Speaking of the future, what next? As you continue to publish, do you feel the need to somehow build a bridge towards a new direction, given the longform conclusion to Mayhem & Death, or is your work-in-progress more of a break with the past? I’ve just finished a novel which is in the hands of my agent right now, awaiting her keen judgement. It’s a triple narrative, three first-person accounts of the same period of time, a time in which the three met and connected and suffered possession by things from the past. It’s the longest whole thing I’ve ever written, and it is still relatively fragmented due to the nature of the form. First-person was a challenge, even gruelling at times; I could only rarely fall back on lyrical description, especially in two of the narratives due to the blunter nature of the characters involved, and I was examining some pretty dark mental health issues. I hope, after all that, that the results will be worth launching into the world. But if not, I don’t mind..
You’ve said elsewhere that you’ve also been at work on a collection of poetry, and more short stories. Can you say anything about the restlessness of the forms you’re engaging with? I’ve begun another longer project that incorporates both of these forms, weaved into a longer narrative of heartbreak, art, Brazil, and apocalyptic thinking. There will also be a metafictional element again. The short pieces I am writing and luckily getting published will be attributed to the writer/character at the centre of the book. Clarice Lispector is a big influence, as is Kate Zambreno: there is a narrator overlooking all, pitying and judging the character’s actions, and perhaps (if it’s not too awful) her writing as well. I suppose I’m the narrator, though who can tell? I might be the character, too, or neither. I like getting into a tangle and picking my way through it. The restlessness towards forms seems a result of my inescapable sense that fiction is an untrustworthy medium in which to express a conscious understanding of life and our times, as well as of course a means to reach out to others. And right now, as we all know, everything’s quite chaotic. It’s not enough to write something that can divided neatly into a poetry collection, a short story collection, a biography, or a novel. I feel like I must switch and dance about, while still holding out my hand. I want a reader as dancing partner. The reader as wire in an electrical circuit. What’s on the other side of this current, I don’t know.